A customised mix of fitness, nutrition, wellness and support. Our Corporate Wellness Retreats are a great way to kick off a wellness campaign. We customise a day schedule of fitness classes, nutrition seminars, wellness guides and personalised advice on how to achieve your optimal health. As well as being a really fun and fulfilling day for employees, it is an extremely effective way to kickstart your corporate wellness goals and covers all the basics of implementing both corporate wellness and personal health plan in a short period of time. We work with a variety of venues throughout the country and we can also be incorporated into a wider conference or company meet-up schedule. For sample retreat schedules, venues and prices, please contact us. FitVision run Mind & Body Bootcamps that are available to all. 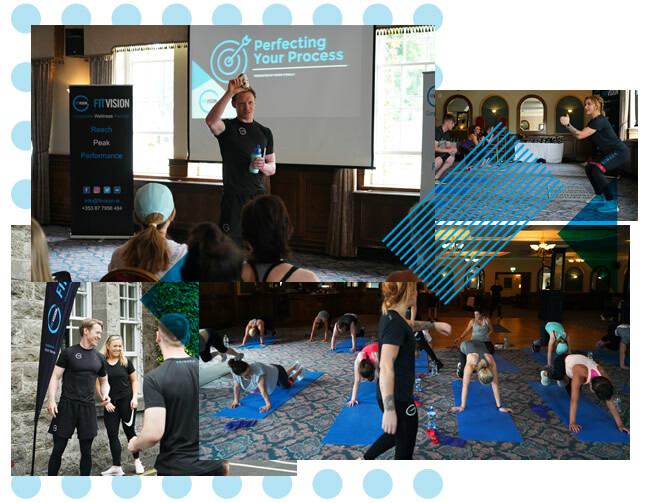 A mix of exercise classes (yoga, box, dance & more), mindfulness, nutrition seminars and discussions, our Mind & Body Bootcamps are perfect for those looking to be inspired to lead a healthier life or those who want to boost their existing regime. Next Mind & Body Bootcamp: Date to be announced shortly.